Rory McIlroy came into the Cadillac Championship insisting that everything about his game is solid right now, and that his ability to contend rested solely on his mental game. His mind must be right, because he played a mistake-free third round at Doral on Saturday. McIlroy made four birdies and no bogeys in the third round on the Blue Monster, his 4-under 68 getting him to 12 under for the week and three shots ahead of Adam Scott and defending champion Dustin Johnson with 18 holes left in the first World Golf Championships event of the season. 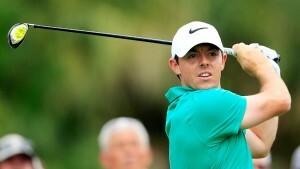 “I just played a really solid round of golf,” McIlroy said. If he wins Sunday, McIlroy would go over $30 million in career PGA Tour earnings, and could get handed the trophy by the course owner himself. Republican presidential front-runner Donald Trump said he will attend Sunday’s final round, though it’s unclear how visible he will be or how much of the day he’ll spend at Doral. McIlroy’s made nine birdies and nine bogeys or worse in two rounds last week at The Honda Classic, which is why his preparation for Doral could start two days early with a missed cut there. At Doral, he hasn’t been flawless, but close enough. McIlroy’s last bogey was on the second hole in his second round. In 34 holes since, it’s been 11 birdies and 23 pars, fueling his climb atop the leaderboard. He took the lead with a birdie at the par-4 fifth, one of only eight made on that hole Saturday. And he escaped brushes with the sand on each of his last two holes, keeping his mistake-free streak intact. McIlroy’s tee ball at the par-4 17th found a bunker — with the wind picking up a bit — so he simply knocked his second onto the green and two-putted from 45 feet. And his approach from the middle of the fairway on 18 landed in a greenside bunker, but he knocked in a testy 6-footer for par to cap the round. Johnson gave himself a chance to end his day with a great par, then missed a 4-footer. After spraying his tee shot way right, Johnson punched out and then knocked a wedge close. But he missed the par try and fell to 9 under for the tournament, 1 under for the round. Johnson rallied from five shots back in the final round to win last year at Doral. This time, his deficit is only three. Willett, Bubba Watson (71) and Phil Mickelson (70) are tied for fourth, five shots off the lead. World No. 1 Jordan Spieth struggled again, his round of 73 leaving him at 2 under for the week and tied for 17th place. Spieth played with Justin Thomas, who followed up a 66 on Friday with a 78 on Saturday. “A rough day for us both,” Thomas said. Doral Notes : A pair of Spaniards, Sergio Garcia and Rafa Cabrera Bello, had the low rounds Saturday, each shooting 67. They’re both at 5 under for the week, tied for seventh place and seven shots back of McIlroy. … India’s Anirban Lahiri, who has never finished better than 28th in four previous WGC stroke-play events, is tied for seventh at 5 under. He shot 71 on Saturday. “This is the third day in a row that we’ve had a different wind. So honestly, I have no idea what to expect tomorrow,” Lahiri said. … Five players shot 80, including first-round co-leader Marcus Fraser who is now 20 shots off the lead.